Sales of the Baseball silver dollars have officially sold out. There is no longer a waiting list. 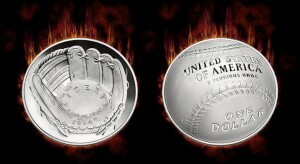 Silver dollars celebrating the diamond anniversary of the National Baseball Hall of Fame officially sold out late Monday afternoon. The United States Mint moved the curved commemorative coins to the "No Longer Available" section of its website, stamped "Sold Out" beside their product names, and removed the option to place orders on a waiting list. Issued in $5 gold, silver dollar and 50c clad and in proof and uncirculated qualities, only the half dollars are now available from the U.S. Mint. Released on March 27, the gold coins sold out within 24 hours and the silver dollars sold out on April 9 with a waiting list option added at the same time. Those on the list are hoping others with earlier accepted orders will cancel. Their wait could be long with shipping of some coins not expected to happen until June and July. Also on Monday, the U.S. Mint published its latest round of sales figures. Numbers remained unchanged from a week ago for the silver dollars and $5 gold coins but moved up by 13,610 to 194,072 for the baseball clad half-dollars. That leaves 555,928 of the maximum 750,000. The Mint is selling the half-dollars at www.usmint.gov/catalog. The following table offers updated coin sales totals and splits. All sales amounts are as of Sunday, April 20, 2014. Sales for all six commemoratives are at 644,072 coins, which puts the combined total in dollars at $45,173,527.40. From that amount and as mandated by Public Law 112-152, a total of $6,720,360.00 in surcharges will go to the National Baseball Hall of Fame to help fund its operations. My silver proof and uncirculated dollars will be delivered, this afternoon, by UPS. If the half dollars are an indication of the quality, then, I will be a very happy camper. I’ll let you know, how they are. @Troy, Relax! They will come when they are minted. The mint had some for sale at the HOF, but from what I’ve seen, many are MS-69 and lower. Be patient, let the mint work out the process. You will be very pleased. Mine were expected to ship April 16. (Waiting.). A few more to ship in June. I received my Silver Proof and Silver Unc. today. I am very satisfied at the quality of these two coins and the two Proof and Unc. clad half dollars. Now, I just have to be patient, waiting for my Gold Proof and Unc. Gold HOF coins. A funny thing happened. I thought I saw a scratch on the reverse of the Unc. Silver Dollar. I examined it through a magnifier, with a light and it turned out to be the “P” mint mark. I’ve never been fooled before. The curved coins give a whole new perspective at looking closely at coins. The US Mint provides CoinNews.net weekly sales figures for its collector coin products. It is these reports that are used as the source for our articles on the subject. The bureau on its website also publishes updated bullion coin sales every weekday. These US Mint sales are presented in our daily gold articles.